After a slow start to the season WR William Dukes has found himself amongst Conference USA’s elite. Catching a touchdown in each of the past three games, Dukes gives the Owl’s a deep threat that has been absent recent years. Coach Sims elaborated saying that the six receivers on this list are threats to any team they face, and have the ability to complete any play that is called. Duke’s numbers in recent weeks has put him as FAU's top target: with 267 receiving yards and 20 receptions. A more impressive number is Dukes’ four touchdowns, that not only lead the team but also have him tied for first in the C-USA. Dukes’ touchdowns through the first six game ties his total for all of the 2012 season. When asked about Dukes’ stellar play this season wide receivers coach Jeff Simms simply calling it his job. “When you say he [Dukes] has a touchdown its like saying John Wallace has got a carry, I mean for us to win football William has to finish-off series for us. That is a juniors role who has been here for three years,” Simms said. Simms went onto elaborate that a three year starter should be at the level that Dukes is playing, and an athlete of Dukes’ caliber should not only be scoring and putting up big numbers, but leading other teammates and younger players. As to what’s the difference between Dukes' sophomore and junior seasons, Dukes has attributed it to his off-the-field work. 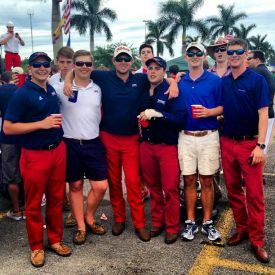 Dukes –– who came to FAU as a 175-pound freshman – put on about 15 pounds in his first season at FAU, although gaining weight is a normal thing during a players freshman year constantly doing so is not. Dukes (pictured) used this offseason to build to his frame and one can definitely tell in the physicality of his play. Last Saturday’s game against UAB marked the first time the Owls had two 100-yard rushers in a single game, and perimeter blocking had a big part in that as the Owl’s had three runs for more than 50 yards a piece. 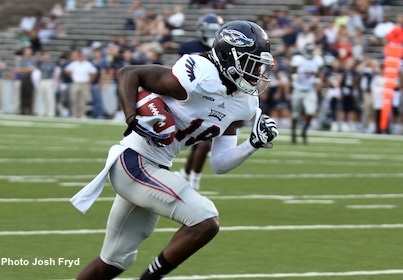 “We have huge expectations for him,” said FAU’s offensive coordinator Brian Wright. Dukes is on pace to catch nine touchdowns this season, the most since Cortez Gent in 2008, when the Owls beat Central Michigan in the Motor City Bowl.